Thank you for this prayer meeting, in view of the upcoming Synod of Bishops. 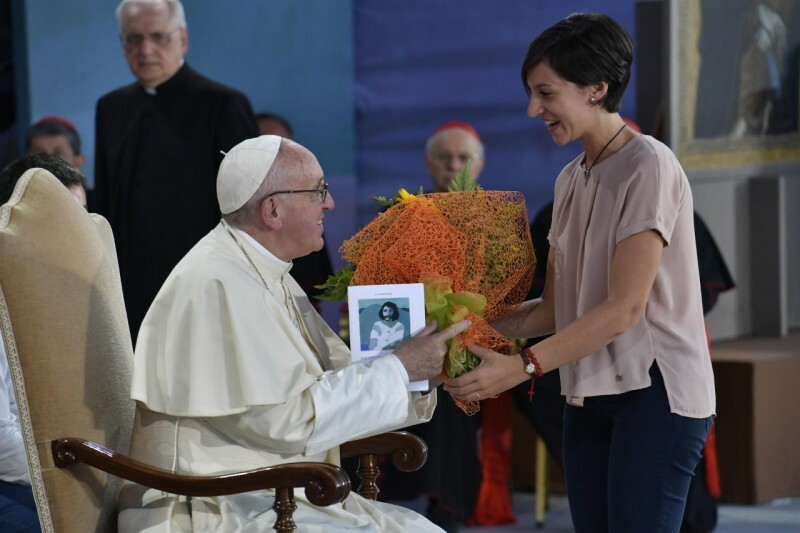 I thank you also because this appointment was preceded by a mixture of many paths on which you have become pilgrims, together with your bishops and priests, along the roads and paths of Italy, amid the treasures of culture and faith that your fathers they left as an inheritance. You have traveled through the places where people live and work, full of vitality and marked by hardships, in cities as well as in villages and out-of-town villages. I hope you have breathed deeply into the joys and difficulties, life and faith of the Italian people. In the passage of the Gospel we have heard (cf. Jn 20: 1-8), John tells us that unimaginable morning that changed forever the history of humanity. Let's imagine it that morning: at the first light of dawn on the day after Saturday, around the tomb of Jesus, everyone starts running. Mary of Magdala runs to warn the disciples; Pietro and Giovanni run towards the tomb ... Everyone runs, everyone feels the urgency to move: there is no time to waste, we must hurry ... As Maria had done - remember? - just conceived Jesus, to go to help Elizabeth. The disciples of Jesus run because they have received the news that the body of Jesus has disappeared from the grave. The hearts of Mary Magdalene, Simon Peter, John are full of love and beat wildly after the separation that seemed definitive. Perhaps it is rekindled in them the hope of seeing the face of the Lord again! As on that first day when he had promised: "Come and see" (Jn 1:39). The one who runs the strongest is John, certainly because he is younger, but also because he has not stopped hoping after seeing Jesus die on the cross with his own eyes; and also because he was close to Mary, and for this he was "infected" by his faith. When we feel that faith is less or lukewarm, let us go to you, Mary, and you will teach us, understand us, make us feel our faith. From that morning, dear young people, history is no longer the same. That morning changed history. The hour when death seemed to triumph, in reality the time of his defeat is revealed. Even that heavy boulder, placed before the tomb, could not resist. And from that dawn of the first day after Saturday, every place where life is oppressed, every space in which violence, war, misery dominate, where man is humiliated and trampled, in that place a hope can still be rekindled of life. Dear friends, you have set off and have come to this meeting. And now my joy is to feel your hearts beating with love for Jesus, like those of Mary Magdalene, Peter and John. And because you are young, I, like Peter, am happy to see you run faster, like John, driven by the impulse of your heart, sensitive to the voice of the Spirit that animates your dreams. This is why I say to you: do not be content with the prudent step of those who are queued at the end of the line. Do not be content with the prudent step of those who queue at the end of the line. It takes the courage to risk a leap forward, a daring and daring leap to dream and realize like Jesus the Kingdom of God, and commit yourselves to a more fraternal humanity. We need brotherhood: risk, go ahead! I will be happy to see you running harder than those in the Church who are a little slow and fearful, attracted by that much-loved Face, which we adore in the Holy Eucharist and we recognize in the flesh of the suffering brother. The Holy Spirit will drive you in this race forward. The Church needs your momentum, your intuitions, your faith. We need! And when you arrive where we have not yet come, have the patience to wait for us, as John waited for Peter before the empty tomb. And another thing: walking together, these days, you have experienced how hard it is to welcome the brother or sister who is next to me, but also how much joy can give me his presence if I receive it in my life without prejudices and closures. Walking alone allows us to be freed from everything, perhaps faster, but walking together makes us become a people, the people of God. The people of God who gives us security, the security of belonging to the people of God ... And with the people of God you feel safe, in the people of God, in your belonging to the people of God you have identity. An African proverb says: "If you want to go fast, run alone. If you want to go far, go with someone ". The Gospel says that Peter first entered the tomb and saw the cloths on the ground and the shroud wrapped in a separate place. Then the other disciple also entered, who - says the Gospel - "saw and believed" (verse 8). This pair of verbs is very important: seeing and believing. Throughout the Gospel of John it is said that the disciples seeing the signs that Jesus performed believed in Him. See and believe. What are these signs? Water transformed into wine for the wedding; of some sick people recovered; of a blind man who gains sight; of a large crowd satiated with five loaves and two fish; of the resurrection of his friend Lazzaro, who died four days ago. In all these signs, Jesus reveals the invisible face of God. It is not the representation of the sublime divine perfection, the one that transpires from the signs of Jesus, but the story of human frailty that meets the Grace that solves. There is wounded humanity that is healed from the encounter with Him; there is the fallen man who finds a stretched hand to cling to; there is the loss of the defeated who discover a hope of redemption. And John, when he enters the sepulcher of Jesus, brings in the eyes and in the heart those signs made by Jesus immersing himself in the human drama to raise it. Jesus Christ, dear young people, is not a hero immune from death, but he who transforms it with the gift of his life. And that carefully folded sheet says it will no longer need it: death no longer has power over Him. Dear young people, is it possible to meet Life in the places where death reigns? Yes, it is possible. It would be wrong to answer, that it is better to stay away, to get away. Yet this is the revolutionary novelty of the Gospel: the empty sepulcher of Christ becomes the last sign in which the definitive victory of Life shines forth. So we are not afraid! We do not stay away from the places of suffering, of defeat, of death. God has given us a greater power than all the injustices and fragility of history, greater than our sin: Jesus has conquered death by giving his life for us. And he sends us to announce to our brothers that He is the Risen One, He is the Lord, and He gives us His Spirit to sow the Kingdom of God with Him. That morning on Easter Sunday the story has changed: we have courage! How many tombs - so to speak - today await our visit! How many wounded people, even young ones, have sealed their suffering "by putting - as they say - a stone above". With the power of the Spirit and the Word of Jesus we can move those boulders and let beams of light enter into those ravines of darkness. The journey to Rome was beautiful and tiring; think of you, how much effort, but how much beauty! But the journey of returning to your homes, to your countries, to your communities will be just as beautiful and challenging. Follow it with the trust and energy of Giovanni, the "beloved disciple". Yes, the secret is all there, in being and knowing that you are "loved", "loved" by Him, Jesus, the Lord, loves us! And each of us, returning home, put this in our heart and mind: Jesus, the Lord, loves me. I am loved. I'm loved. Feel the tenderness of Jesus who loves me. Going along the path to home with courage and joy, follow it with the awareness of being loved by Jesus. Then, with this love, life becomes a good race, without anxiety, without fear, that word that destroys us. Without anxiety and without fear. A race towards Jesus and the brothers, with a heart full of love, faith and joy. Go this way !.